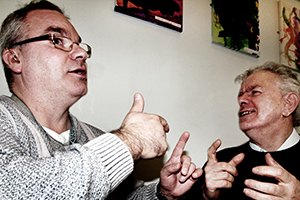 Hayfield offers very specialised and unique services to Deaf adults with additional, multiple and complex disabilities. Including mental health diagnoses, learning disability, autistic spectrum disorder and other lifelong conditions that challenge individuals socially, emotionally and physically. …in better opportunities for an enhanced quality of life and greater independence with deaf people who have additional support needs. …a helping hand to individuals to enable them to fulfil their potential to communicate and interact in a wider community environment. …specialised care homes and housing support options, creative modes of communication, and support with physical & mental well-being. We also provide safety and security support to protect from harm, social and emotional support, meaningful activities & lifelong learning, employment opportunities, and help with personal finance. …the broad range of unique and innovative services we provide to deaf people with additional support needs. Also keep up with all the latest information that we can share with you via our Blog. Hello, my name is Judy and I am the director of services here at Hayfield. Thank you for visiting our new website for the first time or indeed for coming back if you have been here before. I hope that you are able to find what you are after if you are looking for something specific. If you need any assistance, please give me or a member of the Hayfield management team a call and we would be delighted to help you. Hopefully you will discover the broad range of unique and innovative services we provide to deaf people with additional disabilities and also keep up with all the latest information that we can share with you via our blog. By visiting our website you will find a lot of information on what we do, with photographs and videos illustrating the work we carry out . I hope you enjoy the content we have provided, including some links to other organisations we work with. You can view a signed video of my introduction by clicking the link. Even if you have just come to our website for a quick wander around, or to just catch up on the latest information we like to post, we always really appreciate you visiting us, thank you. Please click one of the links below for further information and photographs. We are the independent scrutiny and improvement body for care services in Scotland. We make sure people receive high quality care and ensure that services promote and protect their rights. Hayfields inspections reports for our various service can be viewed online at the Care Inspectorate website or via the links below. The Scottish Council on Deafness act as an intermediary body of organisations and agencies working with deaf people in Scotland. You can read all of SCODs latest newsletter information here on their website. Glasgow City Health & Social Care Partnership has developed a leaflet to provide information for members of the public on Health & Social Integration in Glasgow. A copy can be downloaded from the link below. Glasgow, with a population of around 600,000, is Scotland’s largest city and is the commercial capital of Scotland. It is the UK’s largest retail centre after London. This is our home city and we simply love living here. Charities come in all shapes and sizes and make a massive contribution to life in Scotland. It’s estimated that the charity sector handles over £10billion a year and that 183,000 people in Scotland are charity trustees, with many more as volunteers, paid staff and beneficiaries. Read about what it means to be a charity, what we as Regulator expect from them, and the valuable contribution they make to the life of our country. OSCR Registration Entry – Click Icon above for further details. Our role is to support the individual to achieve the future that they desire.